Often overlooked, face mists are a life-saver pretty much all year round. In summer, however, we simply can’t live without them. 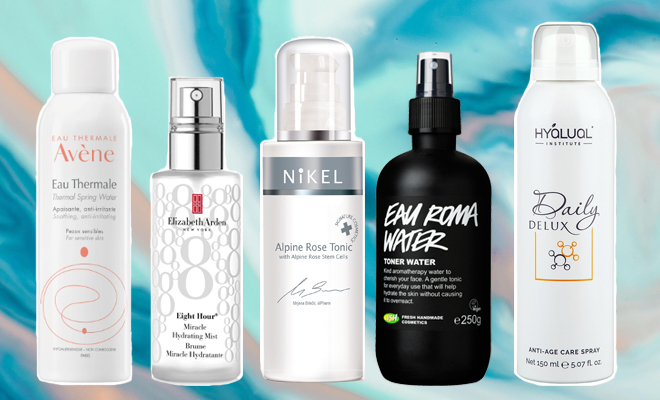 More than just cooling mists, modern spritzers are mostly multi-functional, filled with extra benefits your skin will love. But other than cooling the skin on a hot summer’s day, how do we use these nifty little products? Spray on dry, dehydrated or tired skin for an instant moisture boost. Spray on sensitive skin for a soothing effect. Spray on sunburnt skin – soothing sprays are a great alternative to a gel aftersun as they provide the same cooling effect without you actually having to touch your sunburnt skin. Spray all over your face after applying makeup to set your foundation for the day. Use as a toner after cleansing for extra hydration and to balance the skin. Spritz during and after travel (especially when flying) to beat dehydration and feel refreshed. Seaside lovers, this one’s for you! We’ve been using this refreshing mist from Lush all summer long to cool down in the hot sun and as a pick-me-up after a long day. It smells incredible (think patchouli, rose absolute and fresh sea water) and best of all, it’s free of artificial ingredients so you can spritz away, guilt-free! New to the South African market, Institut Esthederm is a French brand known for this exact product. One of the few patented facial mists, it offers an interesting take on anti-ageing. Infused with antioxidants and hyaluronic acid, it contains Cellular Water, which is the main base ingredient of all Institut Esthederm products. Inspired by the water present in our skins, cellular water optimises cell energy, which, in a nutshell, helps prolong the youthfulness of our skin. We love that this product helps skin get stronger and more resilient over time, making it more resistant to daily aggressors like UV rays and pollution. Our skin goes through a lot of stress without us even noticing it – pollution, smoke and smog can wreak havoc if you don’t take proper precautions. This mist has been designed to counteract the effects of pollution on our skin. It ‘seals’ the skin by acting on the outer layer of the epidermis and progressively restores the skin’s moisture levels. Suitable for all skin types, it can be sprayed in the morning after cleansing, over makeup, at night before bed and during the course of the day. It significantly increases the skin’s radiance making it a suitable option for anyone struggling with a dull or lacklustre complexion. Another great natural product that brings you the best of nature to cleanse and comfort. Containing buchu, honeybush tea and kola nut, this refreshing mist is gentle on the skin but offers astringent, antibacterial and anti-fungal properties. It removes all traces of cleanser and makeup (so great to use as a toner after cleansing) and cleans pores deeply for a clear complexion. Buchu is also known for its sebum-controlling abilities, making this a good choice for oily-skinned girls. Though it feels amazingly soothing on the face, this is one of the few mists you’ll end up applying all over your body. Not only has it been proven to help soothe skin irritations like eczema, razor burn and sensitivity, but it’s also intensely hydrating and cooling. You can apply it as often as you want (in summer you’ll want to spritz it all the time!). It has no scent and absorbs quickly. Our editor swears by it as a post-shave soother for her legs. If you’re already a fan of the incredible Eight Hour range, you’ll want to get your hands on this product too. Rich in antioxidants and vitamins, it has an invigorating effect on the skin whilst offering the nourishing benefits of your favourite Eight Hour Cream. The ultra-fine mist is extremely hydrating and for those who are scent-sensitive, you’ll love that it doesn’t have a strong fragrance. We highly recommend this all-rounder for travelling! We’ve expressed our love for this long-time favourite before, and trust us, it deserves a second mention. This is the ultimate product for rose lovers as it has the most divine rose scent, but what’s most notable about it is that it offers skin repair benefits thanks to Alpine rose stem cells. It also increases your skin’s own stem cell vitality. It’s on the pricey side, but a little goes a long way so the bottle should last quite a long time. Sensitive skins, rejoice! This gorgeous rose water mist calms and reduces redness, and helps balance and soften the skin thanks to lavender water. Plus it’s brilliant at removing stubborn traces of makeup. It’s hydrating and soothing at the same time, and the scent… let’s just say it lives up to our usual Lush expectations. Containing hyaluronic acid for moisture, succinic acid for its antioxidants and metabolic functions and water to restore moisture balances, this anti-age care spray is designed to rejuvenate, moisturise, tone and improve the skin’s texture. You spray it on your skin after you’ve applied your serum and moisturiser as it intensifies the cosmetic action of those products (cue better absorption of your active ingredients). Again, it’s pricier than a lot of other facial mists on the market, but you have to remember that it offers much more than cooling and soothing abilities. 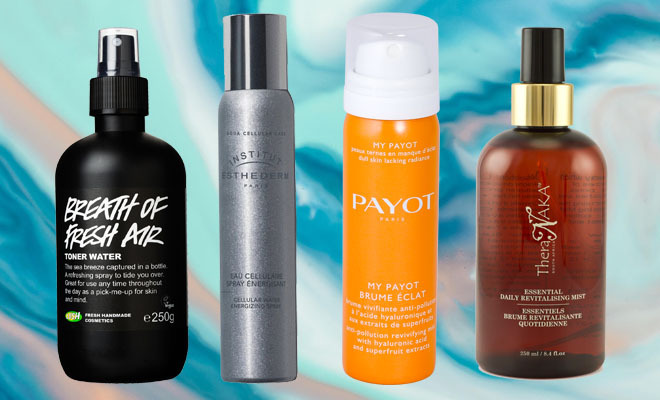 If you’ve tried a great mist we didn’t include in this round-up, tell us about it in the comment section below. the elizabeth arden one works amazingly!! !